Do you think Spring is coming soon? We have our seed potatoes chitting, and the broad bean and sweet peas germinating in the utility, so we are telling ourselves the growing season has begun. At the beginning of March the snowdrops are just finishing, but some crocus are still out here and the daffodils are budding up so it feels like Winter, by the end of March the other Spring bulbs are showing in earnest, so does it feel more like Spring? I am straining at the leash to start seed sowing in earnest as I used to be very optimistic and started sowing all sorts of flower and vegetable seed in February, artificially keeping them warm for several months. We were used to the London microclimate, and persisted in the belief that it was an unseasonably cold spring here for several years. However, most years the plants grew leggy and cramped under cover in little pots because the outside weather was too cold for them to go outside in early April. Although we put up a polytunnel for the tomatoes and peppers they still didn’t like being planted out before very late April because it was unheated, if the night temperatures were below 10 degrees centigrade they sulked, even under fleece. The little seedlings that had been germinated in the propagators inside that were potted on into seed trays and put into the polytunnel similarly hated it and were at a minimum checked in their growth, or turned up their toes. The polytunnel was one of the dreams we had for our new garden, and was to be our big present to ourselves when we moved. 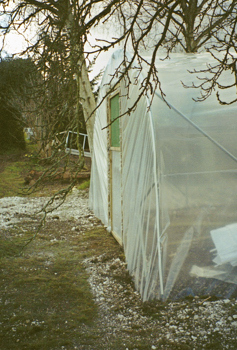 We had only had a 60cm by 2m lean to greenhouse against the garage wall in London, which could take two growbags in it. We wanted something bigger. It was to be for tomatoes and peppers in the summer, and to have oriental greens in over winter. It was to be ready for our first March there – only 4 months after moving in. We determined that the polytunnel would run across most of the width of the garden and be sandwiched between the two Silver Birches and the first of the plum trees in the orchard. This would mean it would be next to the vegetable garden. The widest we could manage this space to be would be 10ft, (3m) and the tunnel would be 20ft (6m) long. The ground sloped down almost 30cm in that 3m. The Silver Birches would provide shade from the sun so that it would be in dappled shade in the middle of the day, getting early morning sun to warm it up first thing. Research led us to choose an entirely plastic covered tunnel (you could have net/mesh or part mesh along one side or the ends for ventilation). After much thought, we decided on filled in ends with doors rather than open ends with a gate arrangement for the bottom half, or fully open as many commercial ones are. We chose doors as seen in the first picture below. (Apologies again for the quality of the pre-digital pictures.) These doors were to have plastic in the bottom half and mesh in the top half (for ventilation when the door was shut), but including a “blind” of plastic that could be rolled up or down and fastened to shut out the cold. As you can see, the door is very close to the fence – about a metre away from it in fact, and the tunnel is roughly NNW-facing. Most of our “weather” comes from the northwest so the breeze generally comes in slightly diagonally to the polytunnel, not directly through the door – also the fence being that high it blocks quite a bit. I expect many of you have Greenhouses or Polytunnels and are aware that no matter what we thought, they could always do with more ventilation in them than we had installed. I think in hindsight we were more focussed on needing to keep heat in for lengthening the season (so having solid plastic almost everywhere) rather than the ability to let any of it out when it got too hot. All I can say is tomato plants must be very tough as they have to withstand an enormous variation in temperature from well over 40 degrees centigrade to only 10 within a few hours in our tunnel. 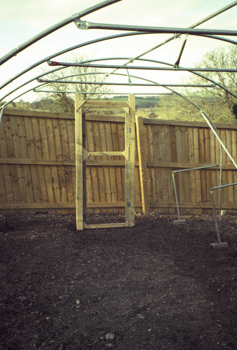 We also decided to have collapsible structures on one side of the polytunnel to hold staging so that we could have two tiers of plants in pots on that side if we wished, intending to divide the rest of the ground inside the tunnel into a central bed, and a bed along the other side of the tunnel to grow directly into the ground. The second photo shows the frame and the structure for the staging to rest on as well as the door for the other end of the tunnel. 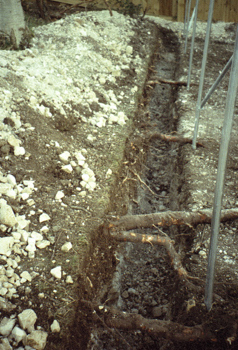 You can also see here mounds of chalk, as once you have put up the frame you have to dig a trench 30cm wide and 45-50 cm deep all the way round so that you can anchor the plastic you cover the frame with in this trench and back-fill it with the spoil. Let me show you a picture of one of these trenches to show you some of the challenges we faced with this site. I hope even this very grainy predigital picture shows all the Silver Birch tree roots on this side (and there were plum tree ones on the other side) which we had to carefully dig round and excavate under. You can also see how shallow the topsoil is. Although chalk is a soft rock, it is a rock, and had to be dug out with pickaxes and mattocks and took a long time in the short winter days. We had tasked ourselves to have finished these trenches before the February half term holiday. 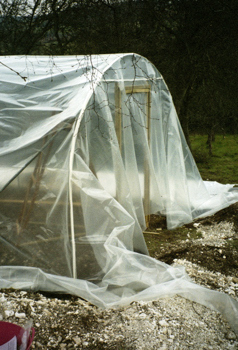 The polytunnel covering is, naturally, one enormous sheet of quite stiff plastic, and we needed a very calm day so that it didn’t try to wrap itself round the tree branches and get damaged as we wrestled with it. We centred the plastic as much as possible, to ensure there was enough to cover each end, then laid it into the trench on one side, putting some spoil on top to anchor it, and then pulling it over the top. Having a site that was not level really showed at this point, and we had enormous difficulty making the plastic taut along the whole length on both sides – the more baggy it is the more wind rock it gets and the more prone to damage and splitting. You have to put cushioning tape along the metal poles where the plastic is to be stretched over to also help it not split as it wears and moves over time. The most challenging bit is trying to fit the plastic over the ends, keeping it taut over the door jambs. See the pictures below to show our very impressive pleating! The fifth picture also shows the door with the mesh top (in green) fitted in too and the white strip of cushioning tape along the metal frame at the end. Once we were sure we could not improve the fit, we stapled the plastic to the door jamb and cut off the excess, and in terrible cold wet weather filled in the trenches with the back-fill, stamping them down, and hoping the extra weight of the spoil would further stretch the plastic taut. Once back in the house, my husband realised he had mislaid his wedding ring. It must have slipped off his cold wet finger whilst filling in the trenches. Words were said. It was pitch black by then and stormy, so a sleepless night ensued, and in the morning we started digging out all the trenches again poring over all the spoil and hoping the ring would come to light. More words were said. A couple of hours later, I had run out of words to say and was frantically beginning to think we would have to find a metal detectorist to come and help search when suddenly I found the ring hiding directly underneath one of the biggest tree roots in the trench by the Silver Birches. What a relief! Brief pause for a cup of tea from the thermos before refilling all the trenches again. The plastic is guaranteed for (I think) five years, and is expected to last seven before splitting and needing replacing. You are provided with repair tape, which is like wide Sellotape for mending any splits that occur, and after five years we did have a couple of quite big horizontal splits towards one end of a long side where it was a bit baggy and had constantly moved. Each winter we repair them, and each summer they separate again. We try and view it as added ventilation! More splits are beginning to come now, though. Given we put it up in February 2005 it is not doing too badly. For the past few years I have been expecting that it will suddenly disintegrate over the winter, but so far it has struggled on. Each autumn when the tunnel is emptied, and spring before it is filled, we clean the plastic inside and out with a solution of weak washing up liquid, using sponges carefully on it, and hosing it to rinse it, otherwise it has been maintenance-free. 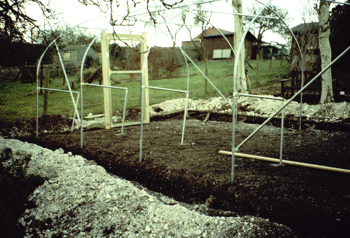 I will blog on another occasion on how we planned to use the polytunnel for horticulture, and how its use has developed over time. Next time, spring blossom, and creating drifts of spring bulbs in the orchard. 1 Comments To "On a Chalk Hillside March 2017"